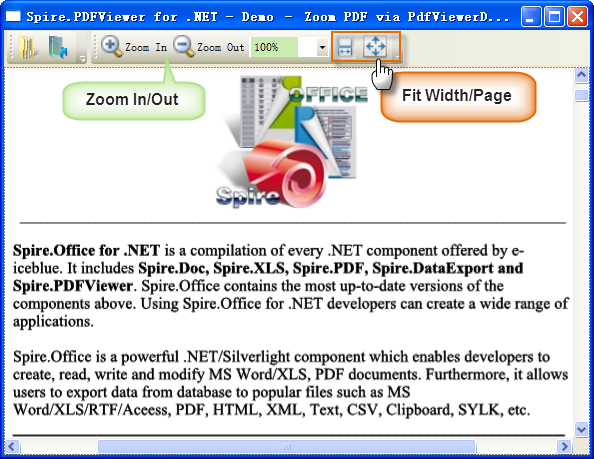 Spire.PDFViewer is a powerful PDF Viewer component for .NET. It allows developers to load PDF document from stream, file and byte array. Spire.PDFViewer is available on viewing PDF/A-1B, PDF/X1A and enables to open and read encrypted PDF files. This PDF Viewer control supports multiple printing orientation including landscape, portrait and automatic. Furthermore, it can export PDFs to popular image formats like .bmp, .png and .jpeg. When viewing PDF document through Spire.PDFViewer, users can set display as fit page, page down/up, zoom in/out, etc. Spire.PDFViewer is a totally independent .NET library which designed for viewing PDF files from .NET application. It does NOT require Adobe Reader or any other 3rd party software/library installed on system.